One of the many things I enjoy about volunteering for Boston By Foot is the opportunity to go on private tours. These tours take us around and into places we would not normally get to visit—one of my favorite things to do. In January, a group of BBF members was treated to a private tour of the newly renovated Emerson Colonial theater on Boylston Street in Boston. It The Colonial Theater replaced the Boston Public Library’s second location before the BPL moved to its current spot in Copley Square. Now the oldest continually operating theater in Boston, the Colonial long served as a stepping stone to the Great White Way. We may think of Boston now as Title Town for our dominant sports teams but for the world of legitimate theater, it was Tryout Town. Originally named the Colonial theater, The Emerson Colonial opened in 1900 with a production of Ben Hur and became the oldest continually operating theater in Boston. The Colonial—which is how I remember it—joined several other buildings within a few blocks that were designed by the architectural firm of Clarence Blackall. These include the Little Building on the Corner of Tremont Street and the Wang Center/Bosch Center a block away. The Colonial Theater replaced the Boston Public Library’s second location before the BPL moved to its current spot in Copley Square. Now the oldest continually operating theater in Boston, the Colonial long served as a stepping stone to the Great White Way. We may think of Boston now as Title Town for our dominant sports teams but for the world of legitimate theater, it was Tryout Town. 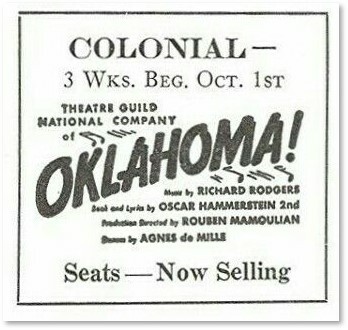 Until 2015, the Colonial housed pre-Broadway shows and provided the first stop for new productions. This allowed the cast and director to see what worked in the show and what didn’t work so they could make important changes before moving on. Did that joke fall flat? Replace it. Did that song not move the audience to tears? Fix the music or the lyrics. Did that dance number leave them sitting on their hands? Jazz it up. As a testing ground, the Colonial Theater gave Bostonians a chance to see plays like Oklahoma!, Porgy and Bess, A Little Night Music, Follies, Anything Goes, and The Odd Couple. A time traveler could stand in the entrance and watch the greats enter, from Neil Simon to Stephen Sondheim, from George M. Cohan to George S, Kaufman. In fact, our tour started with an evocative video of testimonials from theater professionals with fond memories of the old Colonial Theater. Bostonians who could not travel to New York could take the T to Tremont Street. And go they did. College students on dates, married couples celebrating anniversaries and birthdays, seniors with their grandchildren, all went to the Colonial Theater on an evening out. When they arrived, audiences gloried in a Baroque beauty, a theater filled with so much ornamentation that one didn’t know where to look first. Mr. Blackall wanted to give Bostonians a taste of European glamor and the Colonial Theater delivered on his vision. It was — and is again — a visual knockout from the entrance to the orchestra. 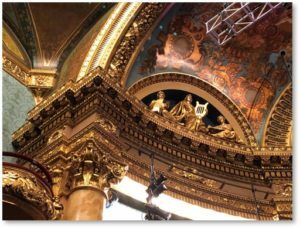 That golden glory has returned, thanks to the Ambassador Theater Group, which oversaw an extensive renovation. (Emerson College owns the theater and the ATG operates it.) On our private tour, we saw it all. The renovation made some accommodations to comfort and the times. The ticket window has been lowered, for example, to meet the Americans with Disabilities Act. Bathrooms were renovated and heating/cooling systems upgraded. Backstage improvements make staging shows easier, safer, and more flexible. Otherwise the renovations honored the original decorations and recreated them when they were missing or worn. 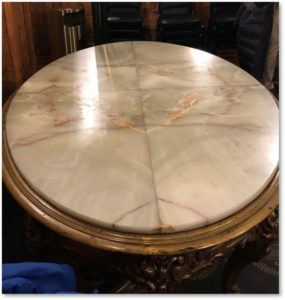 The ATG went to great lengths, for example, to replace the carpeting in the Orchestra Lobby using the original manufacturer and a design from 19th-century look-books. Workmen hand-stenciled original design motifs on the auditorium walls. Passing under the new Boylston Street marquee, you enter the foyer with its barrel-vaulted, coffered ceiling ornamented in burgundy, green and gold. Murals of fruit draped with golden garlands line the walls in marble frames. Along the floor, intricate mosaics of the muses laugh and cry amid even more colorful fruit and flowers. From there you go into the Orchestra Lobby, facing the double-helix staircase up to the balconies. To the left is the lobby itself. Mr. Blackall based its design on the Hall of Mirrors at Versailles. The original mirrors from 1900 gleam from frames of carved and gilded wood. I found myself wondering what reflections would appear if we could only see into the past. 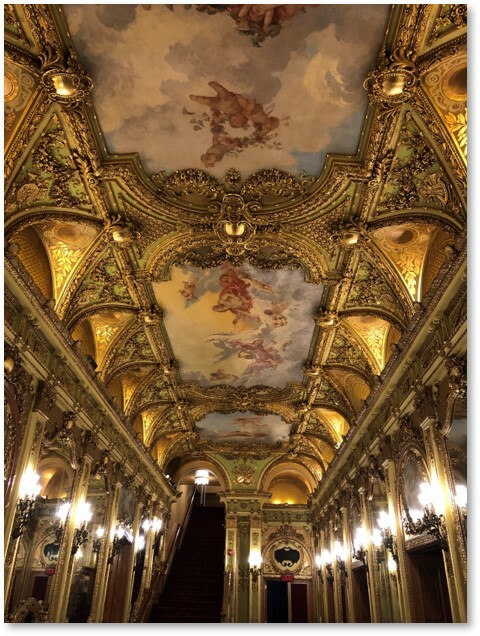 Stage royalty may have ruled the back of the house but many famous and prominent people strolled through the Orchestra Lobby, wearing tuxedos and top hats, furs and fine jewels, gowns and glamor. With the crystal chandeliers and sconces lit for our tour, the Orchestra Lobby glowed. 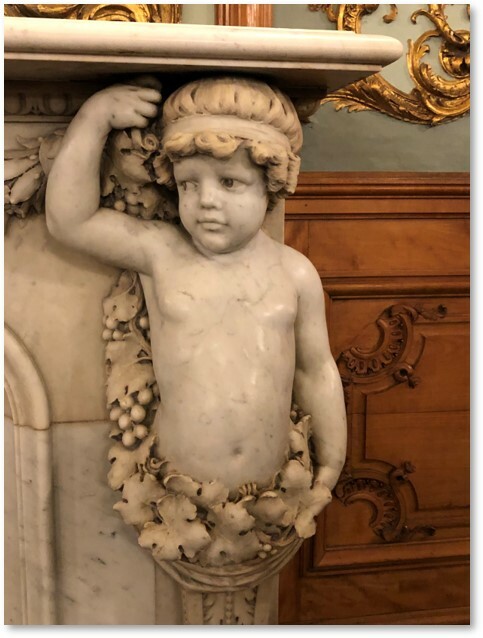 I knew from having been in the Colonial a few weeks previously that it’s hard to appreciate the woodwork, the murals, the gold and the crystal when the lobby is filled with people bustling about. They distract you and get in the way. That night, with the space empty of theatergoers, it felt like standing in a jewel box. In the new lounge to the left, we saw a ceiling mural of a sky filled with putti, that was like looking out a circular window into a mythological heaven. A marble fireplace with a mantled supported by more putti occupied the far wall. To the right was the theater’s famous onyx table. This impressive piece of furniture, made of gilded wood with an onyx top, is so heavy it takes 10 men to move it. The oval stone top is a good luck charm, though. One night, choreographer Bob Fosse wanted to demonstrate a change to one of the dances but he couldn’t tap on the carpeted floor. Instead, he leaped to the table and choreographed the new number by tapping away on the stone. (Yes, it’s that big.) Mr. Fosse’s shoes chipped the onyx but now performers touch the scars for good luck. We toured the backstage area, the cavernous space where backdrops, props and other stage materials are loaded and unloaded. I ducked into the Orchestra Pit, and saw the signatures of musicians who had played at the Colonial written on the ceiling—all carefully preserved during the renovation. The tour ended on-stage, facing the empty orchestra seats and balconies. It was an impressive sight. The number of seats in that section changes depending on the show and its staging requirements. The original production of Ben Hur, for example, operated with a cast and crew of 350 people and featured eight live horses on stage in full gallop for the chariot race scene. But the orchestra and the two balconies above are impressive. Will the Emerson Colonial ever return to its former status as a venue for testing new plays before their Broadway run? The world has changed since then and it’s too soon to tell. Still, other new productions have become popular and theater management has booked several for this year. So, don’t take my word for it. 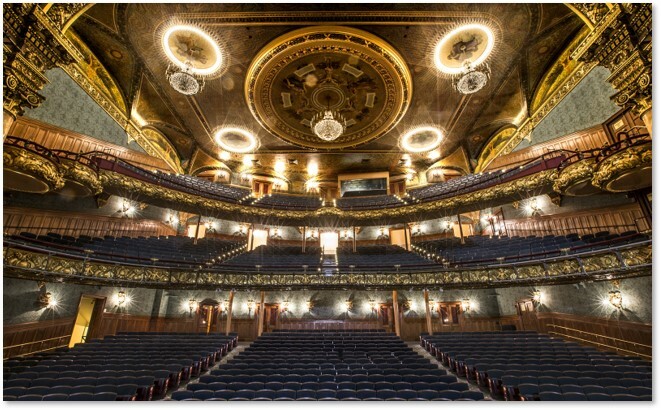 Get some tickets to upcoming productions at the Emerson Colonial Theater and see this beautiful venue for yourself. Trust me, photos do not do justice to the gilding and the ornamentation. It’s really much prettier than anything you’ll see in print. While you’re at it, dress up for the evening. A gilded Baroque theater like this one deserves the respect of an audience that dresses to match its luxurious ornamentation and the meticulous work that preserved it. Put your own reflection into those 119-year-old mirrors. And enjoy the show.